It was a fine moment. Everything was right. There I was, at the world famous Mazda Raceway Laguna Seca, driving my racecar at ludicrous speeds around the racecourse while my pit crew timed my increasingly fast laps. The car was looking great, the team was prepared, and I was passing cars like a madman on a mission. The No. 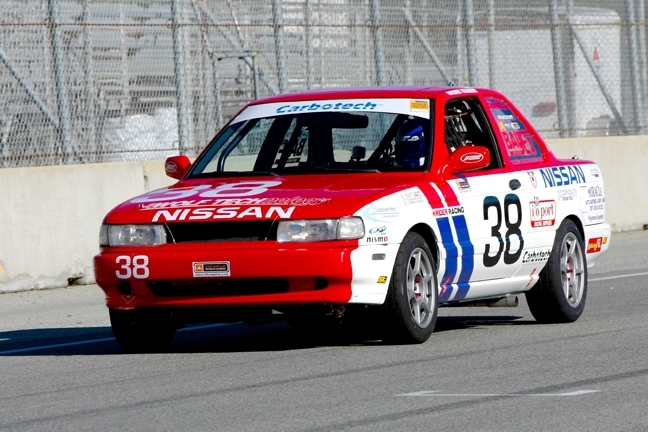 38 Krider Racing Nissan Sentra SE-R flies around the track at Laguna Seca (moments before the car spectacularly loses an engine and the “fun” begins). This moment wasn’t a dream; it was my reality. The No. 38 Krider Racing Nissan was on pace and on its way to win the seven-hour ChumpCar endurance race, the first ever of its kind at Laguna Seca. I could already taste the victory champagne on my dry lips. There was just one small hiccup. In fact, it was microscopic in size. A hairline crack in a connecting rod bolt decided it was done holding the inside of my engine together. It decided to let go and put the insides of my engine on the outside. For those of you not all that familiar with the workings of an internal combustion engine, inside parts on the outside is a bad thing. That little hairline crack let go at 7,700 rpms (that’s a lot), and my piston flew out of the side of my engine block in a blaze of fire and smoke. My moment was over. Instead of the sweet taste of bubbling victory champagne, I tasted the oil and smoke of defeat. I wished I was dreaming—at least then I could wake up from my nightmare. Instead, the nightmare was my reality. Regardless of the complexities of metallurgy, the hairline crack and the physics of metal fatigue, the crew blamed me solely for “grenading the engine” and losing the race. 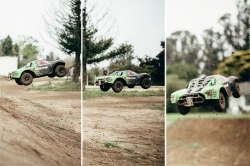 I didn’t deny any fault; I was the one behind the wheel with my foot planted on the happy pedal when the engine went “boom.” The team pushed the heartbroken little Nissan into the car trailer, and I towed it to my house in shame. There would be no trophy riding shotgun in the front seat during the ride home. Instead, my passenger was disappointment. I pushed the broken car into the garage, put a car cover over it like a coroner puts a plastic sheet over a dead body, and closed the garage door. It was sad seeing a car that had brought me so much joy and so many victories left in such a hapless state. Eventually I had to make a decision: Fix the car and fight again? Or quit racing and sell the racecar that had an engine that was better suited to be a boat anchor? As I continued my quest to get back to the track for more “fun,” I had help from Sampson Racing Communications, G Spec Performance, Carbotech Brakes, I/O Port Racing Supplies, Performance In-Frame Tuning, and Jim Wolf Technologies. Eventually, after spending a small fortune, losing three weekends, scraping all of the skin off my knuckles, and inventing three new curse word combinations, I had so much fun that I decided to load the little Nissan back onto the trailer and take it back to the very same place where it died. I got down on my knees and promised the crew I wouldn’t blow the engine up this time, and we all made plans to head back to ChumpCar at Laguna Seca to try again. The plan is to drive hard (but not hard enough to put a hole in the side of the engine), win, and most importantly, have fun. Once the green flag drops, then the real fun begins. Rob’s wife says the fun part will be watching him try to find enough money to put gas in the car to race for seven hours after he emptied their bank account fixing the car.